16 people think this report is great. For years I thought that a walk like this was beyond someone like me. Though I consider myself to be a reasonably fit walker, seeing others' accounts of this grand day out always seemed a step too far. And although I had taken on big-ish days in the past, I always felt spent afterwards. In the back of my head I'd written a 20-mile-plus trip off on account of I just wasn't up to it. Like all inspirational adventures, though, this one refused to fade from my mind. And, given that I'm now into my 40s, I seriously questioned how many more years would elapse before I truly was too old to attempt such a massive undertaking. And, so, I posted on Twitter that I was thinking about doing this, and that if anyone else was keen then let me know. The route. This is a rough, computer-drawn account. It is a few miles short of the actual total of 23.7 miles. I camped in Glen Nevis the night before, not being too keen on a 3.30am alarm call from my bed in Stirling. I questioned the wisdom of this when pitching the tent in very calm, overcast conditions. The midges were utterly incredible. Biblical in quantity, they swarmed around me and made the whole affair a complete nightmare. But, eventually, I settled down for the evening and woke at 5.00am. Robert arrived not long after 5.30am and picked me up from the first car park. We travelled in his car to the head of the Glen Nevis road and headed away at 6am. Speed wasn't going to be a concern for us, and we allowed lots of time so we could savour the day. The main thing was getting round, and if that meant stopping for long periods then so be it. The weather was as good as you could have hoped for. Steall waterfall looking mighty fine. The walking conditions for the first few miles were exceptional. Weeks of essentially dry, sunny weather meant that the ordinarily boggy ground was almost tinder dry. Not only did this make the going easier, it meant the expenditure of fewer calories than normal. This may seem like a daft and overly fastidious thing to think about, but over the course of a long day these small things all add up to make a big difference. 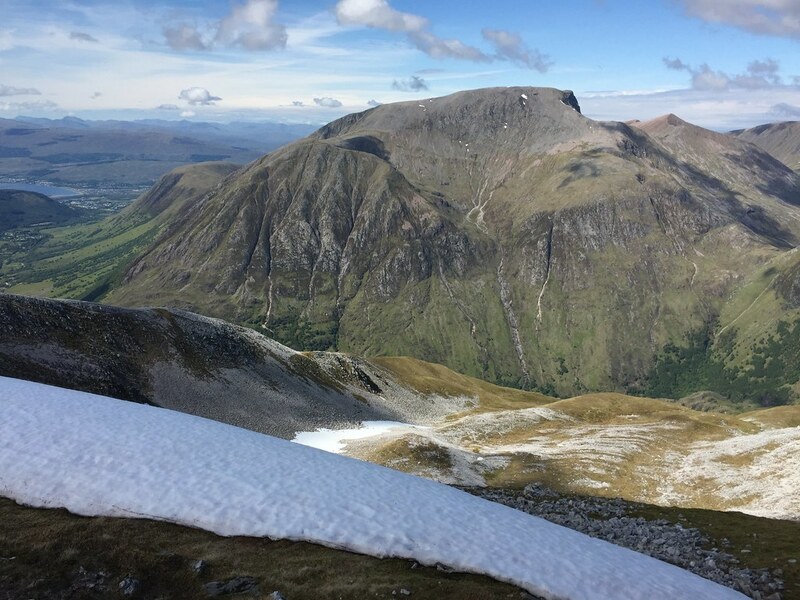 The first Munro, Binnein Beag, has no path from the Glen Nevis side. It is basically a very steep, upwards slog. The angle for the last 1000ft is a close to 45 degrees as makes no odds. It was to be one of the hardest climbs of the day. Robert clambers up the steep slope of Binnein Beag. The reward for our slog. The summit of Binnein Beag looking across to Binnein Mor (Munro 3). The next few miles for me were some of the best of the day. Although the descent from Binnein Beag (you lose a LOT of height) was a bind, the walk up the now good path to the foot of Sgurr Eilde Mor was delightful in the cool calm of the day. By now we had our walking heads on, and feeling in good form we parked our rucksacks at the loch below Sgurr Eilde Mor and promptly (20 mins to be exact) went up Munro 2. We were feeling good! After taking a few snaps we headed back whence we came. The scree slope meant that we were down at the rucksacks once again a mere 9 minutes after leaving the summit. Good going! The summit of Sgurr Elide Mor, looking towards the Glen Coe hills. To Binnein Mor from here involved a decent walk, but it was made immeasurably easier by the fantastic stalkers' path that winds up deftly to the ridge. From there it's a nice breezy walk to the summit of Munro 3. The view from Binnein Mor to Binnein Beag and Sgurr Eilde Mor. Having now done three Munros and covered almost 10 miles, this would be considered a good day's walking ordinarily. I'd have been looking forward to getting off the hill and having dinner. However, when your brain is prepared psychologically for something much bigger it's amazing how it affects you. At this point I could see the rest of the range opening up seemingly endlessly in front of me, and instead of feeling a dread I felt exhilarated. The walk from Binnein Mor to Na Gruagaichean was very straightforward, and we were there in 30 mins or so. From the summit of Na Gruagaichean looking towards Loch Leven. 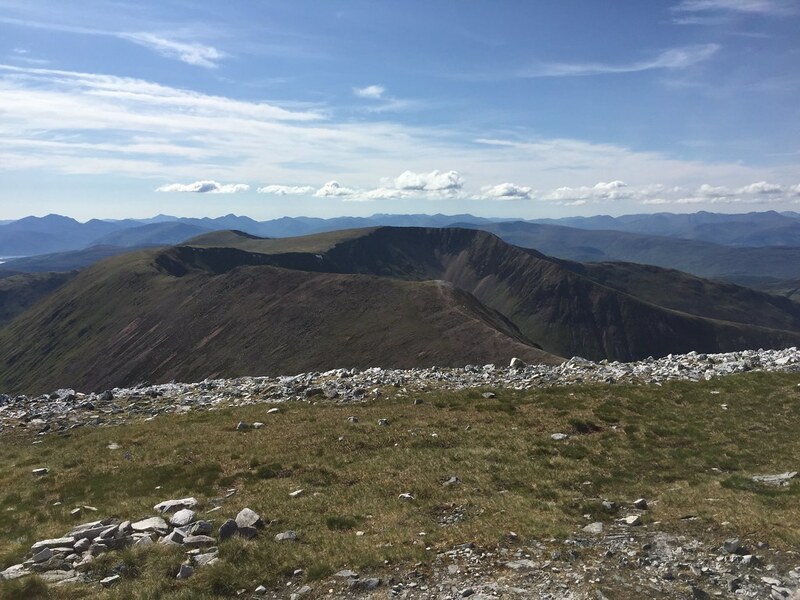 Four Munros down, six to go. We knew psychologically that the next section was going to be tough. Not only do you lose a lot of height, but the walk up to An Gearanach is hard and long. An Gearanach (on the right of the twin peaks) from the bealach (783m) below Na Gruagaichean. Eventually we made the summit ridge and, again, took off the rucksacks at Bealach a Chadha Riabhach, knowing we'd be back for them soon enough. The walk out to An Gearanach was, for me, the trickiest part of the day technically. I'm no lover of heights, and this ridge has a few airy sections. Before too long, though, we were on the summit, and retraced our steps to the rucksacks, where we had a good intake of food and water. An Gearanach from near the summit of Stob Choire a' Chairn. The next Munro, Stob Choire a' Chairn, was straightfoward, and hardly seemed worthy of the status. However, we were happy to summit number six of the day. Munro seven, Am Bodach, didn't look too testy either. However, looks can be deceptive! Although the approach was good and steady, the final 600 ft or so is horribly steep. Far better going up it than down, I should imagine. We passed five walkers coming the other way who did not look as though they were enjoying the experience. Am Bodach from Stob Choire a' Chairn. From the summit of Am Bodach, looking back whence we came. Seven down, three to go! We knew now that we were getting there, and that any thoughts that we might not complete the round had vanished. Not that we even discussed this, of course, as neither of us would even have admitted it came into our heads. The Scots' word 'thrawn' comes to mind. 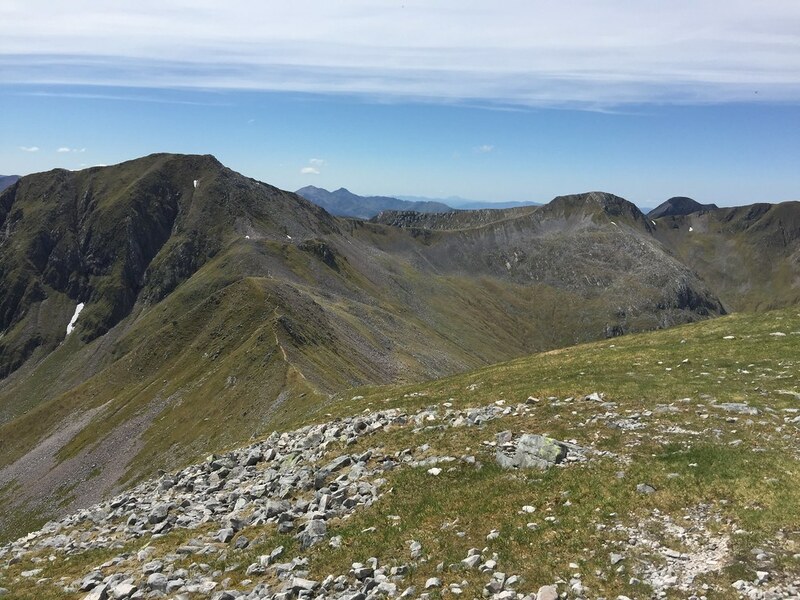 The next and eighth Munro, Sgurr a' Mhaim, would necessitate another 'there and back' visit along the so-called 'Devil's Ridge'. Neither of us had done this before, so we were a little wary. In the end it was a piece of cake. Sure, it might be scary in a Force 10, but actually the walk out and back was a decent and pleasant one, albeit the final haul up to Sgurr a' Mhaim was tiring. Robert walks along the ridge towards Sgurr a' Mhaim, with the Devil's Ridge in the background. 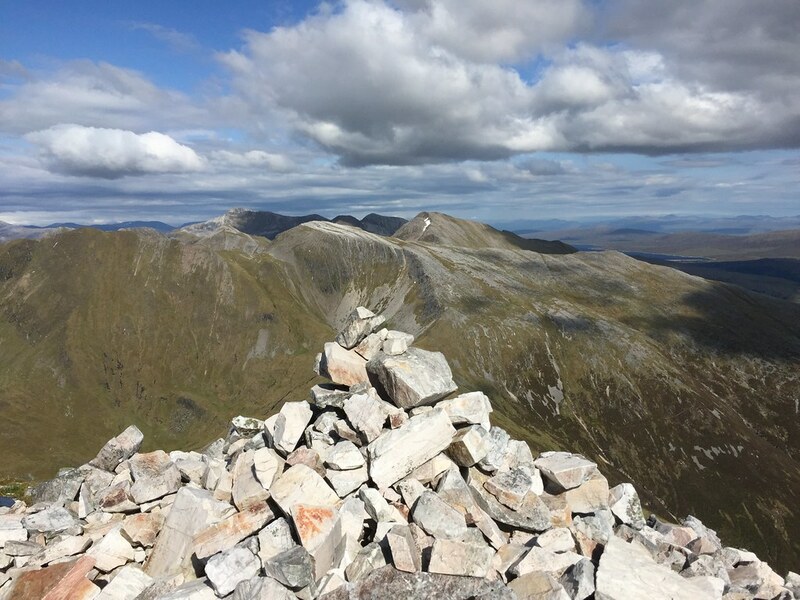 From the summit of Sgurr a' Mhaim towards Ben Nevis. Glorious. 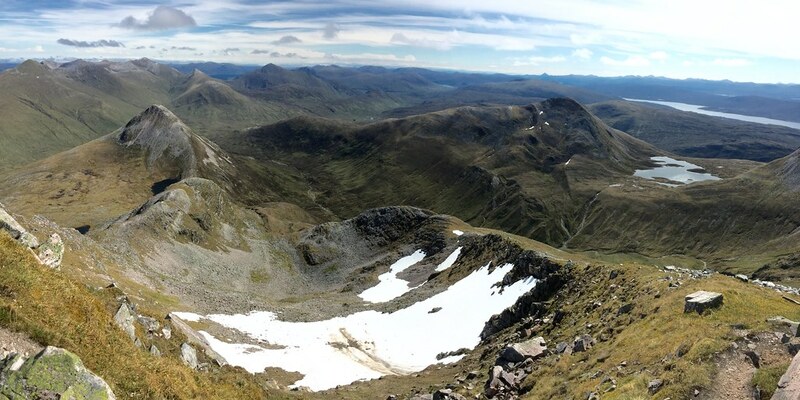 Panorama of our trek from the summit of Sgurr a' Mhaim. We sped back down to pick up our rucksacks below the bealach near the demoted Munro Sgurr an Iubhair. By now we had no water left, but knew that we could replenish our bottles at the idyllic Lochan Coire nam Miseach. Also, rather than using the stalkers' zig-zagging path, we elected to glissade down the bone-dry grass, thereby saving more time and calories! Lochan Coire nam Misheach. A true oasis in an otherwise barren place. The water from the stream tasted like nectar to our thirsty bodies. We filled up our bottles and made for the penultimate Munro, Stob Ban. This fabulously photogenic mountain has always attracted me, and seeing it in the flesh at close quarters was a joy. The approach to Stob Ban. The joy was short-lived, however, as this turned out to be the hardest part of the day. 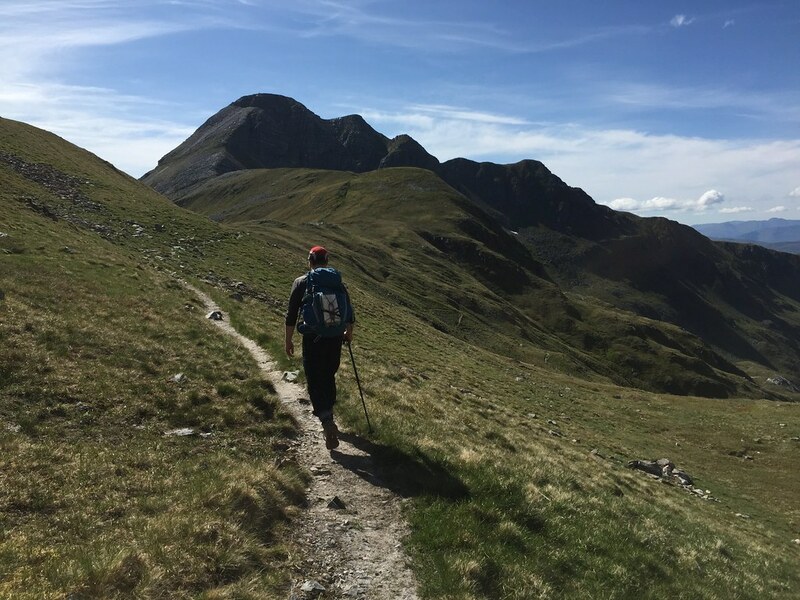 By now, eight Munros and 18 miles in, our bodies were starting to grumble. The legs were getting tired, and asking them to haul us up another 800-odd feet was getting mixed responses. This is where having two like-minded people is invaluable. Neither of us wanted to show the other we were struggling, and we doggedly rose to the summit. When there we both admitted that had been the toughest climb yet. Looking back from the summit of Stob Ban. Mullach nan Coirean from the summit of Stob Ban. In ordinary circumstances this would have been an easy stroll. However, after 20 miles and 9300 ft of ascent it wasn't so easy. By this point, though, we were coasting. Perhaps even in autopilot. The work was done, and all that remained was the final few km to the summit. 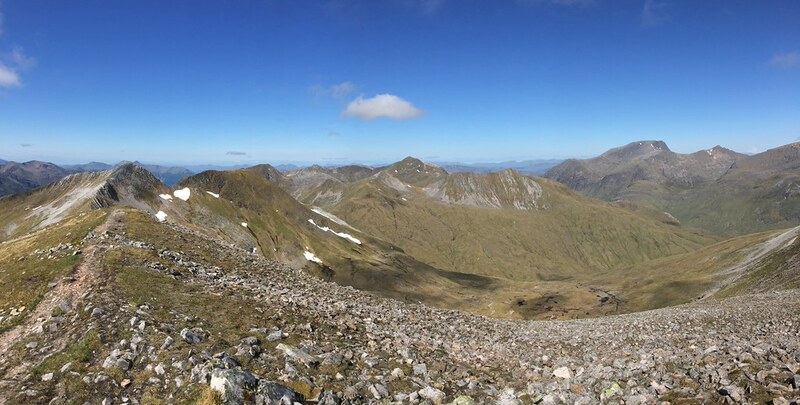 Stob Ban on the right, from the ridge to Mullach nan Coirean. Made it! The last and tenth Munro of the day. Reaching the top was a surreal experience. On reflection it was almost anti-climcatic. The whole day's exertions culminated at this point, and although I was relieved I think, too, I was a little sad that it was now over. I'm not sure why that was, but when you invest so much energy in a walk like this it can do funny things to your mind. Perhaps it was because days like this might not come again in the future. Who can tell? Anyway, from the summit we made our way down speedily to the car in less than an hour. Never have I been so glad to see it! My thanks must go to Robert, whose constant positivity and general fitness was a source of inspiration on the way round. Had he not come along I doubt I'd have done this myself. This walk is best shared with others, I think, and I am sure this day will live long in his memory, as it will surely do in mine. Last edited by ronofcam on Mon Jun 06, 2016 7:26 pm, edited 2 times in total. Good effort. 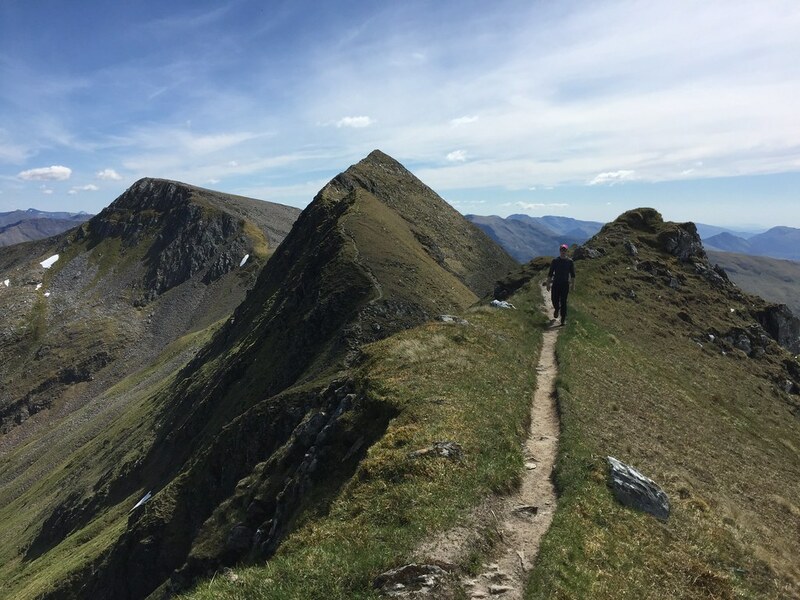 When you think how you can go up and down one Munro and reckon you feel tired, then 10 seems utterly ridiculous, but as you say, when you have it in your head you're going to do it then it all becomes possible. 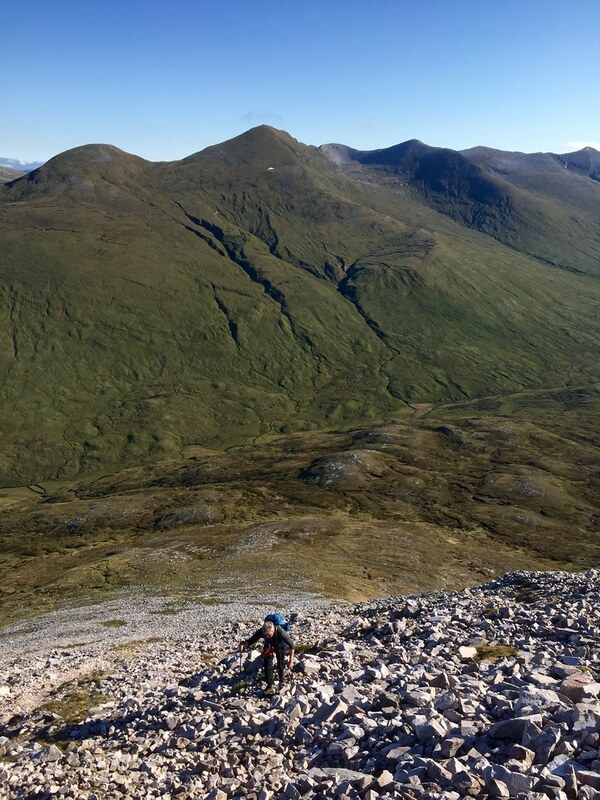 Haven't done the Mamores in a one-er, but the Fisherfield Six (when they were all Munros), the S Glenshiel Ridge and the 5 Cairngorm 4000ers were all big days that remained a pleasure right to the end (okay, I was suffering a bit towards the end of the Fisherfield round). Having the legs helps, but I think it's where your head's at that counts. Cracking day an yway - well jealous. Great stuff, a wonderful adventure with great weather too. This is most definitely on my to do list. Never be afraid to challenge yourself! What's next? tinajack68 wrote: Great stuff, a wonderful adventure with great weather too. This is most definitely on my to do list. Never be afraid to challenge yourself! What's next? It has definitely whetted the appetite! Not sure what lies ahead. I will have a think... Possibly Seanna Braigh and the Ben Dearg hills in one go...? I did the Glen Ey Munro's of Carn Bhac, Beinn Iuthan Mor, Carn an Righ, Glas Tulaichean & An Socach last summer - great day out. Was probably best that I didn't look at the elevation profile till afterwards! One thing worth mentioning is that, as stated, much of this walk rests in the mind. Sure, it's a big day out, but providing you keep hydrated and well fed then it's very do-able. If you approach it thinking 'I'm never going to be able to do this' then you'll struggle. If, however, you approach it thinking 'I'm going to do this' then you're increasing your chances immeasurably. 1. 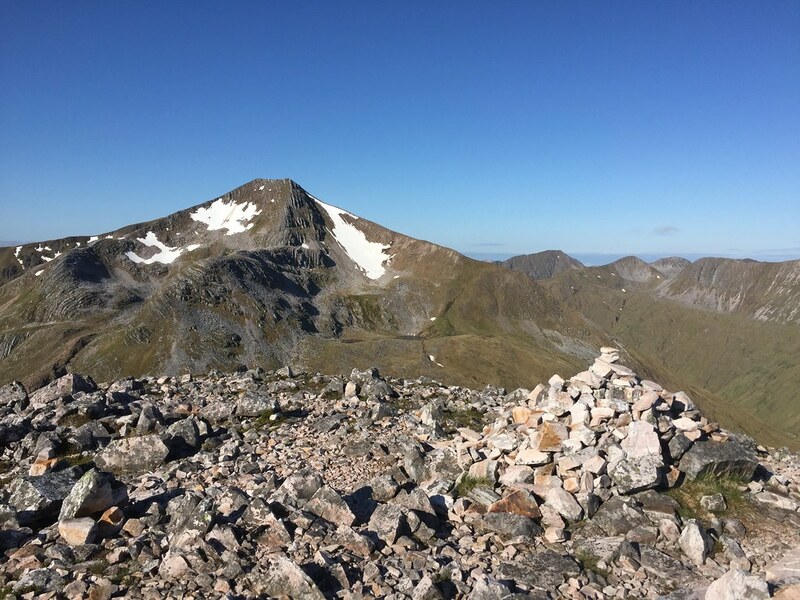 The first Munro, Binnein Beag. Always good to get number one under your belt. 2. 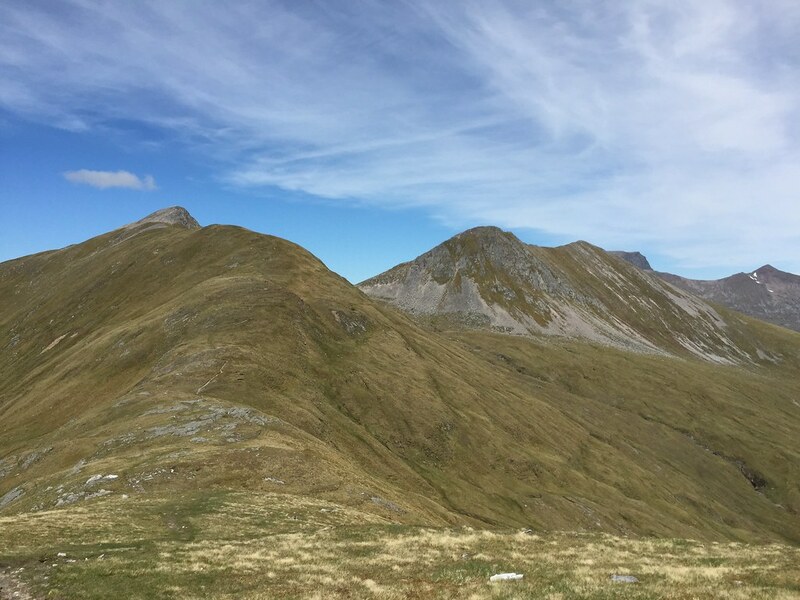 Munros two and three (Sgurr Elide Mor and Binnein Mor). After these are done you're on the ridge 'proper', and the long section of the first three Munros is done. This is an important mental high-point. 3. 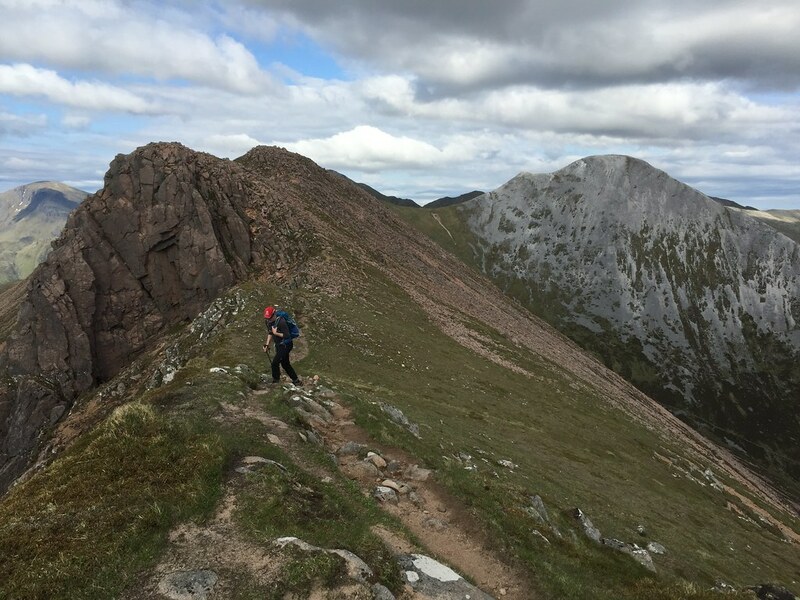 The long drop and re-ascent to An Gearanach. Munro four, Na Gruagaichean, is a doddle. 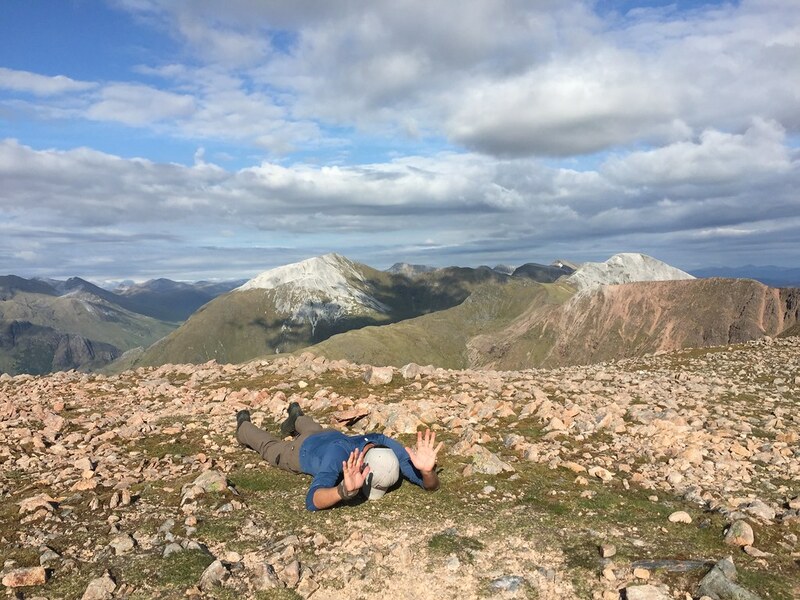 However, one of the undoubted low morale points of the day is when you're at the 783 metre bealach between that hill and Stob Choire a' Chairn. It's a long and tough hike to An Gearanach. Once you reach that, though, you really feel like you're getting there. 4. Munros five and six. 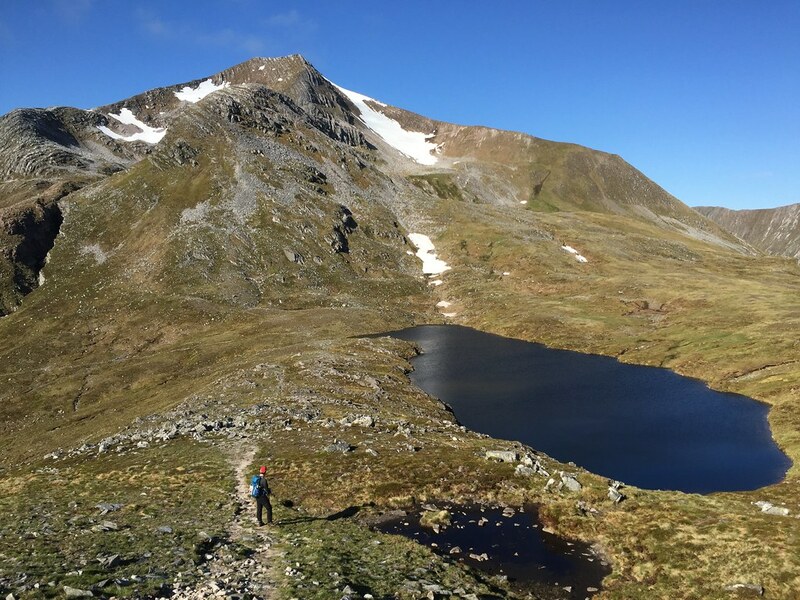 The walk from An Gearanach to Am Bodach, which takes in Stob Choire a' Chairn, is straightforward and relatively easy, right up to the final push up Am Bodach's steep summit. Once this section is done you can see where you've come from and where you've got to go. It's a good psychological boost. 5. The walk from Am Bodach To Sgurr a' Mhaim. 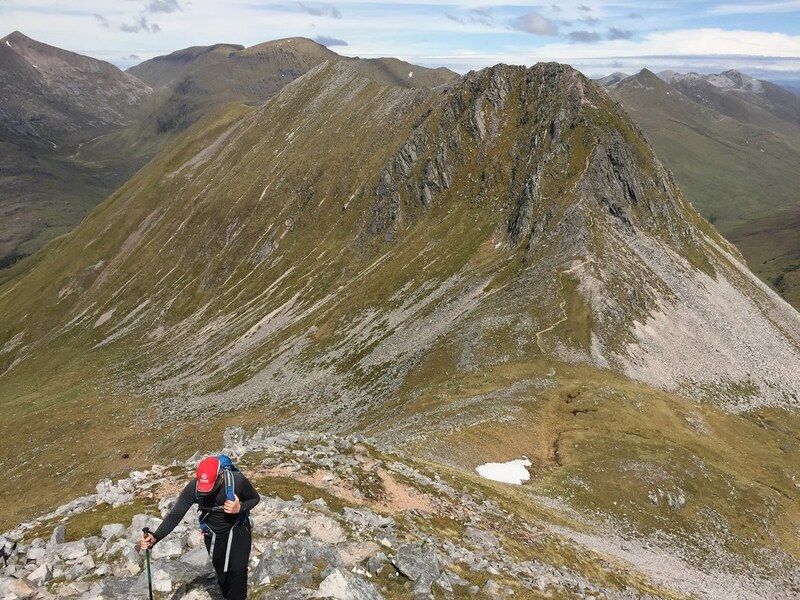 We found the so-called 'Devil's Ridge' quite straightforward, and although the pull up to the peak of Munro number eight Sgurr a' Mhaim was steep, it's not long or particularly difficult. When you're on the top you know you're almost there. 6. From Sgurr a' Mhaim to Lochan Coire nam Miseach. This was almost joyful. Once you get back to the bealach between Sgurr and Iubhair and Stob Choire a' Mhail you can (literally) slide down the hill to the lochan, where watter bottles can be filled. A real high point in the day, knowing that only two summits remain. 7. The ascent of Stob Ban. Though only a short section, this was one of the toughest of the day. Weary bodies mean this becomes a slog, especially on a hot day. Reaching the summit is very welcome. 8. The walk to Munro 10. A mere formality. What a great report and what a day to take on a walk like that. Well done to you both! My friends and I tried exactly the same route over the weekend you did it but time, heat and lack of water got the better of us. 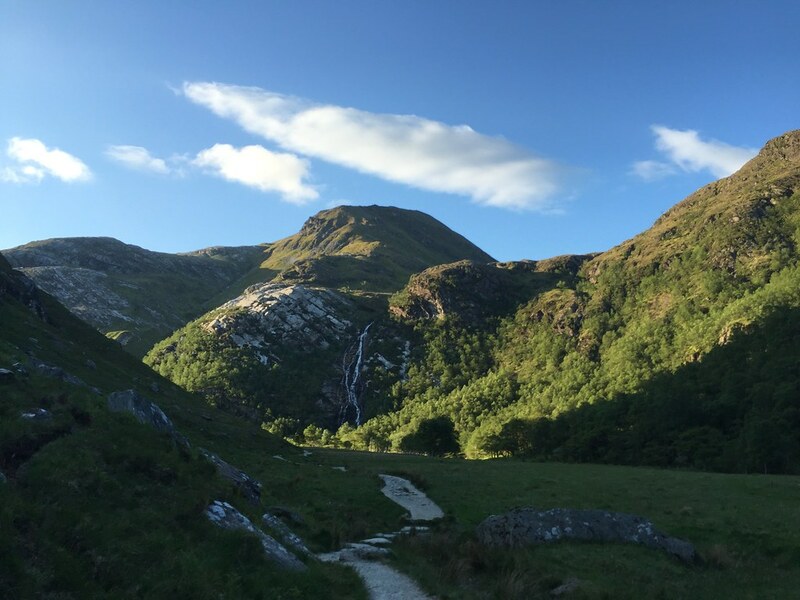 We parked our car at the lower car park in Glen Nevis at 10:30 on Saturday and walked up the Glen, with Binnein Beag as our first, leaving our bags lower down also. We then walked on to Sgurr Eilde Mor and had a fantastic wild camp at Coire an Lochain. We set off from there at 7am on Sunday, we were absolutely baking in the heat and carrying rucksacks was making it very hard going. We dropped the bags at Stob a' Chairn to head over and back to An Gearanach, which totally wiped us out in the heat of the day. As we had to get back to Edinburgh, we made the call to finish the day and head back to the car. Arriving at 17:50, that took us 4 hours! 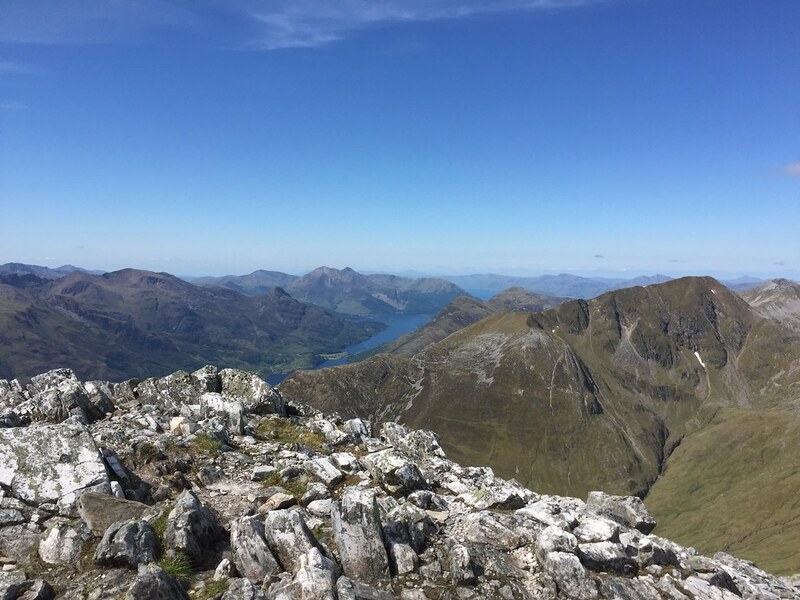 I'm pleased we achieved 6 of the 10 Munros. Take away lessons from the experience would be: start much earlier, more water, day packs rather than wild camp, be strong and push on! 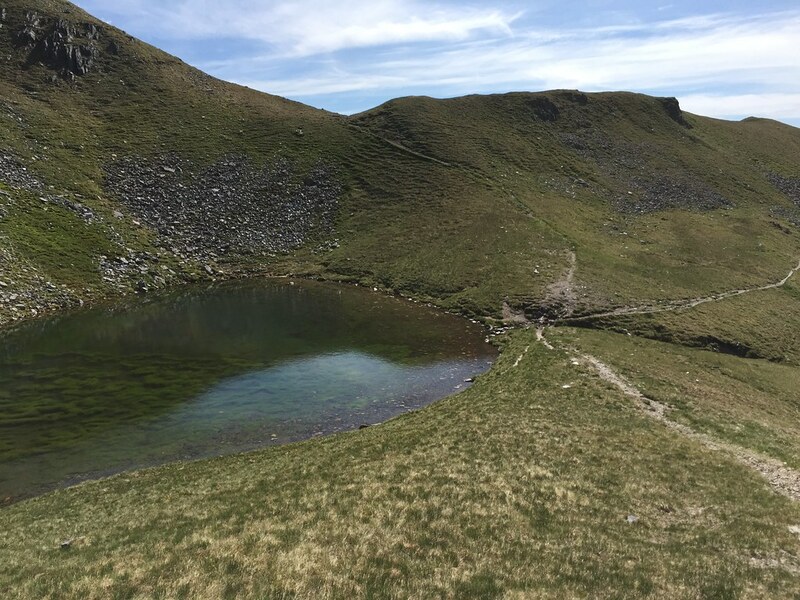 Nesa wrote: Take away lessons from the experience would be: start much earlier, more water, day packs rather than wild camp, be strong and push on! Good effort! We packed only about 1.5 litres of fluid, aware that travelling light was going to be the key to doing this. Our logic was that we'd be able to fill up at various points on the route. However, we had scoped this out before, so knew where water would be had. In the end this worked out well. The heat of the day was almost oppressive at times when we did it, but there was a decent breeze at times. That helps. As Adam Watson told me, it can be too still on a big day out. A breeze is good for morale, as well as for staying cool. In the end, though, there's little better than sheer pig-headedness and core hill fitness. If you have these then the rest gets easier! We packed only about 1.5 litres of fluid, aware that travelling light was going to be the key to doing this. Our logic was that we'd be able to fill up at various points on the route. However, we had scoped this out before, so knew where water would be had. In the end this worked out well. We had a 1 litre bottle each and then 2 reused 500 ml bottles between us on the 2nd day. We filled up at the Lochain where we camped on Saturday night. 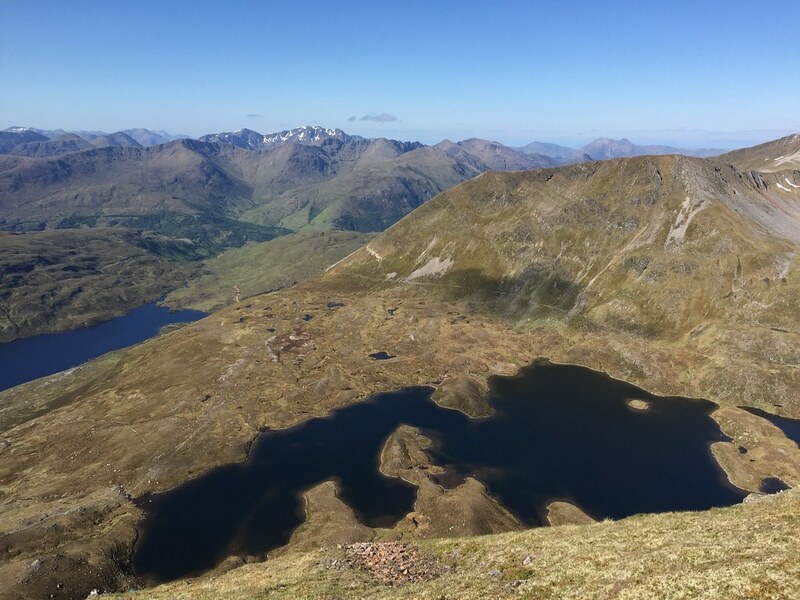 Sunday was so hot, we ploughed through our water really quickly and we were rationing with little sips until the next lochain below Stob Ban. In hindsight, I should of taken my 1.5 L bladder and an extra 500 ml bottle. Even so, I still don't think we would have made it with our time constraints . 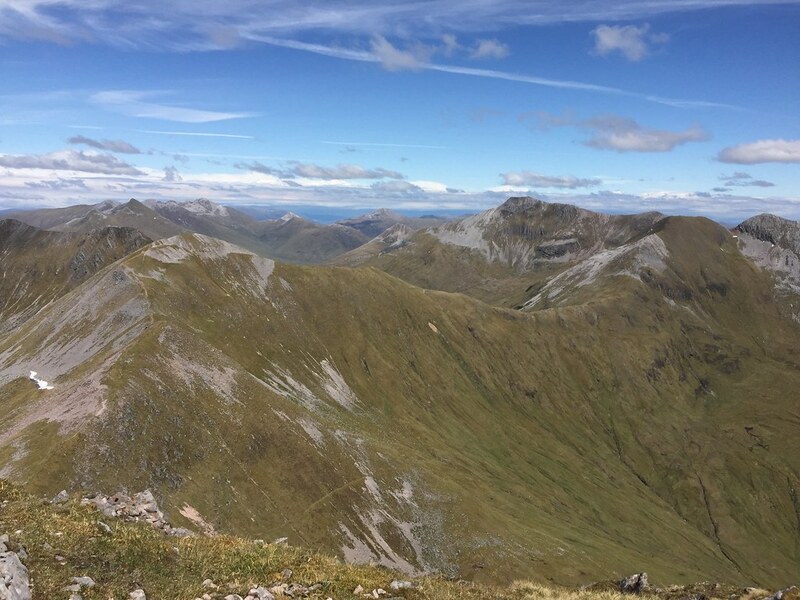 I was convinced the 10 Munro route was impossible until I saw your walk report! Nesa wrote: I was convinced the 10 Munro route was impossible until I saw your walk report! It's quite do-able. There are quite a few on here who've done it, and providing you're reasonably fit and prepared to travel lightly then there's no real issue.